Scott McLaughlin has dominated the WD-40 Phillip Island SuperSprint with another convincing win in today’s 200km race. Home ahead of current champion Mark Winterbottom, the 22-year old Volvo driver proved he was back in business after taking his first win in over 12 months yesterday. He becomes the first multiple race winner in 2016 and was emotional crossing the line 1.005sec ahead of ‘Frosty’. Thanks to the victory, he slots into second in the championship behind Whincup. “This means so much … we’re coming back and I think we’ll have a good one this year,” McLaughlin said, getting out of the car. Winterbottom admitted he struggled a little, saying McLaughlin was in a league of his own. 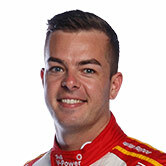 DJR Team Penske’s Scott Pye came home third, earning his first podium since New Zealand last year despite radio issues. It wasn’t so positive for his teammate Fabian Coulthard, who started fourth but was stuck in the garage most of the race with a power issue. A late race Safety Car bunched the field for a sprint home and while six-time champ Jamie Whincup looked poised to pounce on McLaughlin, an error cost him second position at the final corner. He crossed the line in fourth but holding onto the championship lead. Whincup had a gusty go at passing the Volvo S60 off the start on the outside of turn one, running onto the grass and managing to hold onto the car and second. “We were going for the win of course,” Whincup said. The pit stops cycled through and Red Bull’s Shane van Gisbergen fell down the order. His team took a punt on strategy, going for a third stop and he powered on from 20th to 10th. It was a tough day for Cameron Waters, who experienced a tyre failure on the front straight; and Jason Bright, stranded with no power at turn four with a handful of laps remaining. The V8 Supercars next hit the track at Barbagallo Raceway in Perth from May 6-8.